Tess Read: The Corinthian Spirit! 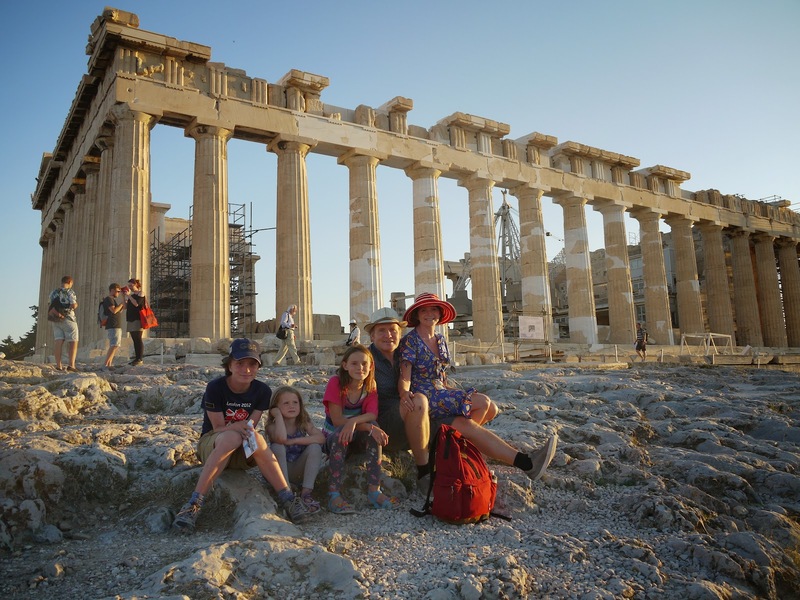 From Corinth to the stunning Acropolis at Athens, then out of Europe and into Jordan for a white-knuckle ride to remember..
We journeyed from Corinth to Athens on a clean and half empty train - perfect for a travelling family. Beautiful views out to sea for much of the journey, and we got the kids all doing different kinds of school work, mostly happily, mostly successfully. Now that's what I call round the world schooling. Wow! The Acropolis is really high above Athens, and the walls out from which all the buildings are impressive. And the whole site is really big. Wonderful to wander over, with all the slippy marble underfoot from thousands of feet over thousands of years. 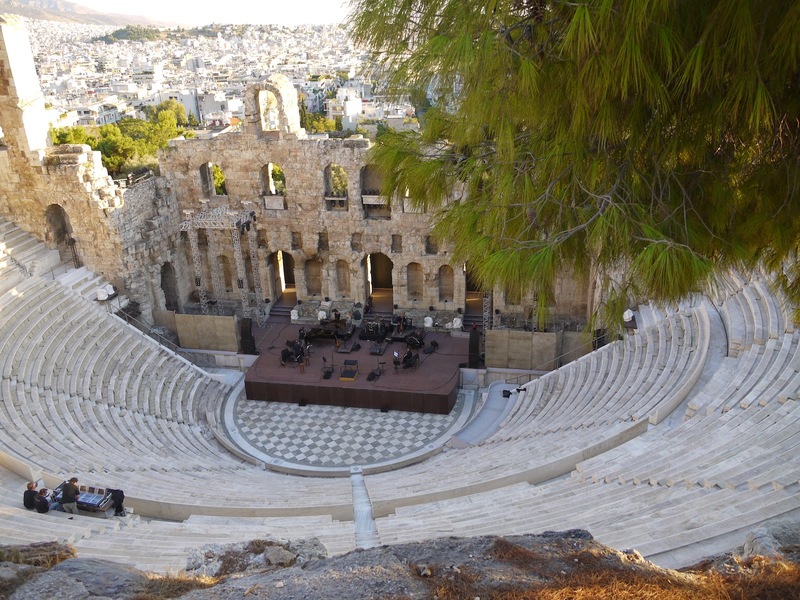 There were plenty of other people there but it wasn't too crowded, there was plenty of room for everyone, and it was no longer too hot to be in the sun.The views over Athens, white and glistening in the lowering sun, were wonderful. But the Parthenon and the Erecthion were the best - the Parthenon is still truly fabulous to look at, even if it has lost its marbles. It does make you wonder, though, how incredible it would have looked at the time - complete, covered with friezes, and decorated with brightly coloured pigments all over it. I wish someone would build a full size replica, that would really be something. The stone ladies holding up the Erecthion were a beautiful sight, and the sight just got better as the sun began to set - the Parthenon and Erecthion were lit up in the pinkest of pink hues while the setting sun gave us a perfect sunset over Athens. 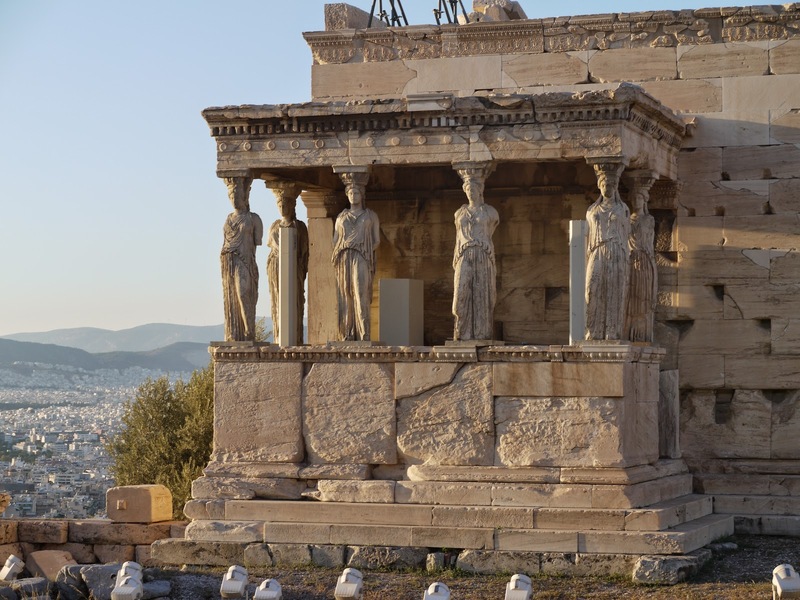 We all agreed it was the most perfect visit to the Acropolis. Now on to Jordan and out of Europe! We hire a car and, of course, I am driving it again. But it's only a couple of hundred km down the big motorway that runs the length of the country, so it'll be a breeze - maybe an hour and a half, two hours max. Right? With the sun setting big wide well-lit roads lead away from the airport. And then pretty suddenly, the situation changes. I had it in mind that Jordan was a rich Gulf oil state and that the roads would be new and shiny. Not so much! We didn't help ourselves by going the wrong way for at least half an hour, because we assumed that the sign saying turn back on yourself to get to Aqaba, meant that we would follow a laid out clover leaf road pattern. Errr no. It meant do a U turn on the motorway from the fast lane! Having failed to do that and finding ourselves going the wrong way on a rapidly disintegrating road in the now pitch black and with the petrol making an alarmingly quick descent to zero I spotted a petrol station on the other side. A quick U turn from the fast lane later, now I'm getting into the swing of it!, and we were in the company of not only life-saving petrol, but also a chap who understood enough English to get us in the right direction. Not the petrol pump attendant who understood nothing but the colour of the money we held out to be converted into petrol, ie knew as much English as we know Arabic, but a random fellow buyer of petrol. So we are seriously out of our comfort zone here - we are now far enough away from the tourist trail that we cannot rely on people to speak English, and it is frightening how disturbing it is to be confronted by road signs almost all of which are not in a language which you can understand a single word or letter of, or even recognise the shapes to know whether or not you have seen the same sign before. I thought the drive would be a 2 hour cruise along fast newly tarmacced well lit roads. It turned out to be a 3 hour white knuckle ride, the like of which it has never before been my misfortune to drive, on a road which alternated rapidly between being a motorway with central reservation and speeding trucks, to being the main drag through a collection of fruit stalls and incredibly brightly lit cafes, with the same speeding trucks crashing through the potholes, and taking off over the speedbumps. Yes speedbumps! On the motorway! I didn't see the first one, or the second, in fact I think it was only by about the 11th or 12th that I was able to spot them and adjust driving accordingly. There was a particularly exciting moment when we saw the first sign to Petra, which we had been losing hope of ever seeing, let alone actually finding the "lost" city, coupled with a van suddenly appearing from my right ready to drive me into the oncoming traffic, when at the same time there was a sudden speedbump. Dear God! And on top of all of this our headlights were the weediest I have ever seen, and with the lack of any sort of lights, even catseyes, for most of the journey, I spent a great deal of it very concerned indeed that I really could hardly see a thing. Good job I didn't have a severe headache and dizziness... We took to shouting yee-haa! as we jumped unexpectedly over a sudden speedbump. Turns out the road we were on is literally called The Desert Highway. But, we made it. We arrived at Wadi Mousa and in the first outskirts of town Danny suddenly shouted out that here was the Petra Sella Hotel - thank God!!! The hotel looked very nice, the staff very friendly, I remembered that we weren't all sharing one room, as I had feared, but we had two rooms next door - one for kids and one for adults I said. Surprisingly they all went for it. The rooms are great - kids' eyes opening very wide at the shiny marble floors and the crisp white linen. And the staff then offered us the dinner buffet - chicken, rice, potatoes, everyone found something. And so to bed. A new country; so far, so good.